There is a political contest afoot. Several candidates are vying to replace State Rep. Gabe Leland, who is unable to run for re-election due to term limits. The race has essentially narrowed to Harvey Santana and Stacy Pugh. Both are political newcomers so it's hard to judge their viability. 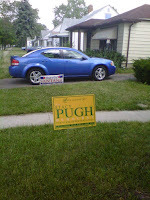 Harvey Santana has been planting lawn signs throughout the neighborhood for several weeks. Stacy Pugh, however, has been catching up quickly in recent days. This lawn sign battle has produced an interesting side-effect. 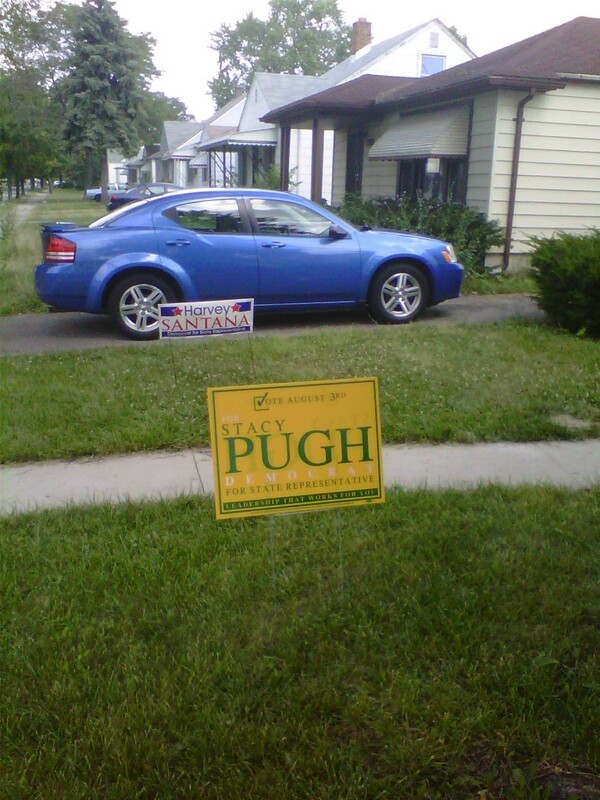 There are several homes in the Warrendale neighborhood that have signs for both Harvey Santana and Stacy Pugh. One can immediately ask: what does all of this mean? The short answer is: pretty much nothing. I'm a firm believer in the old political adage, "Signs don't vote." Regardless, this is trend does provide some interesting comedy.